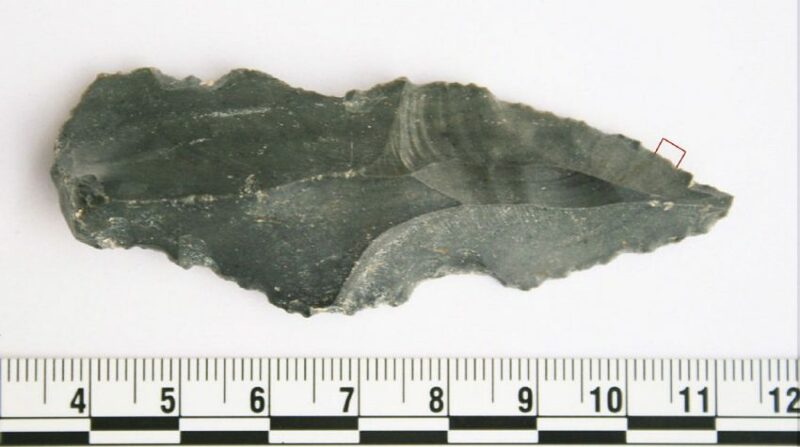 VICTORIA—It’s supposed to be impossible to squeeze blood from a stone, but a Canadian-led team of archeologists has extracted rhino blood from a Stone Age hand axe that is dated at 250,000 years old, the oldest evidence of early human hunting activities. The University of Victoria-led team of researchers has found protein residue remains of butchered horses, rhinos, cows and ducks on stone tools discovered at an archeological site near Azraq, Jordan. Expedition leader April Nowell, a UVic paleoanthropologist, said Friday the protein discovery reveals early humans were capable of taking advantage of a wide variety of prey in a challenging environment hundreds of thousands of years ago. The previous such evidence from early human stone tools was dated at 11,500 years old. The team, which also includes researchers from universities in the United States and Jordan, excavated 10,000 stone tools over a three-year period in an area of northwest Jordan that is desert today but was once a wetland oasis. Among the stone tools were scrapers, flakes, projectiles and hand axes, known as the period’s Swiss Army knife, said Nowell. Of those tools, 44 were selected for testing and 17 tested positive for protein residue, with blood and other animal products, she said. “The proteins, blood and fat tissues get pushed into those little fissures and crevasses (of the tools) and they preserve well in those little crevasses and those microfractures,” said Nowell. She said the researchers were able to confirm the proteins through a residue matching process involving animal antibodies. Nowell said human bones have not been found in the area, but the stone tools and the animal proteins tell a story that involves early humans adapting to a difficult environment by hunting and scavenging wildlife. She said she can’t explain how the early humans managed to hunt a rhino. “We don’t know exactly how they took down the rhino or how they were able to process the rhino or exploit it,” Nowell said. She said the study has the potential to revolutionize knowledge of early human diets now that the ages of proteins and other food byproducts can be increasingly measured. “Once people start to realize these organics do survive much better than we had thought, people more and more will start looking for them and the amount of data we’re going to have about the diet and the strategies of these early humans is just going to skyrocket,” Nowell said. The research will be published in the Journal of Archaeological Science next month.